Every week, the New York dojo sinks a little more into its groove. This week, easily the best of the show’s short run at the Stand, saw host Luis J. Gomez looser and quicker-witted, amazing criticism and feedback from judges Robert Kelly, Ari Shaffir, and Mark Normand, and gave The People’s Wave a chance to really shine on stage – and off, with a little promo from our host. 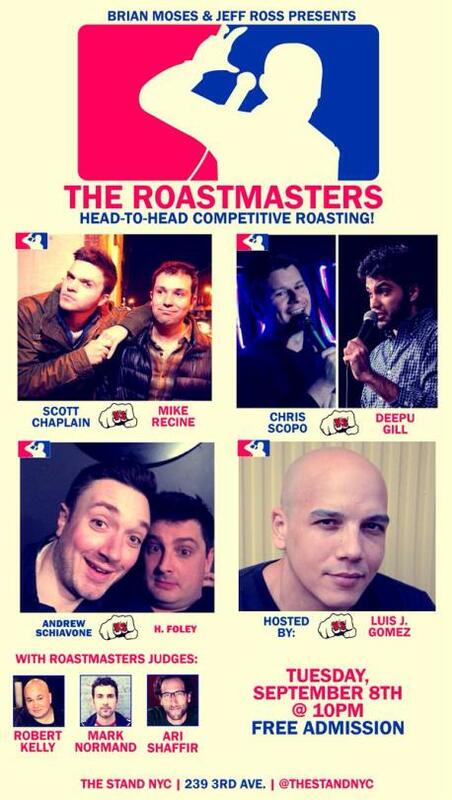 The first battle is between two young comics and co-workers: Chris Scopo and Deepu Gill! After the closing bell, Luis comes rushing back to the stage like he’s trying to press the emergency stop button on an out-of-control escalator. Deepu, on the other hand, tries valiantly but can’t get much to stick. He makes a joke involving the host that didn’t fly, a joke about mowing Robert Kelly’s lawn that required more setup than Deepu gave, and a joke about Chris’ sleepy energy that makes the crowd yawn more than chuckle. The round ends. The crowd can barely catch their breath from laughing. The judges actually have a real decision to make this time, though Foley pulls it out by a 2-1 vote. “Foley’s from Philadelphia, and he’s like the movie Philadelphia with Tom Hanks. Because his career is dying a slow and curable death. The judges are as split as they were the last round, though Schiavone winds up taking the round not only because of his powerful jokes, but also because Foley kept breaking the rules to interrupt Andrew’s delivery. Future battlers, take note: respect your opponent’s time and everything will be cool. After these five jokes, the competitors unleash a string of duds, prompting DJ Will Winner to drop the Price is Right failure music and giving him one of the biggest laughs of the round. All three judges give the W to Andrew Schiavone, and especially to the crowd for not having to sit through another battle involving Deepu. The night’s headlining battle is between two friends and fellow horrible people: Mike Recine and Scott Chaplain! The first round was wild for sure, but the judges worried aloud that it was a bit uneven, with Scott winning the first half and Mike winning the second. Eventually, due to revealing the fact that Scott told Mike about his sister’s stripper past in confidence, Mike wins the round by being “a true piece of garbage,” in the words of Ari Shaffir. In the end, though Mike still has Robert’s heart and vote, Scott gets votes from Ari and Mark. The two hug then return into the New York City night, where they’ll go be terrible humans on some other stage in the bustling city. We’ll see you back next week!